In today's world, neither learners nor tutorials are confined within the walls of a classroom. The computer and the Web have liberated both the teacher and the learner. They meet transcending the limitations of time, space and individual differences. 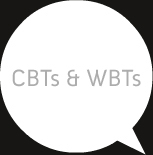 In the fast-moving progressive world today, CBT and WBT score highly above the other traditional methods of teaching. They have an edge as they maximize enterprise-wide alignment and productivity, while minimizing costs and redundancy. Epoch Studio works with you as your e-learning partner to design the courses to make learning more convenient and effortless while retaining the focus on dynamism and innovations.